Cannot wait to try this! Thanks for the great tips!! How are they unable to leave when the lid remains off the jar? The dish soap acts to break the surface tension on the liquid, so they drown. I’ve also used wine in place of apple cider vinegar and it works as well. In BC, we call them fruit flies but in Alberta, they are called drain flies as they eggs are under water. So if you have issues with Drain(Fruit) flies,at night put a small amount of cooking oil(TBS) in all sinks with a goose neck trap. This will cut off O2 and the larve dies. No other treatment is required. Ps: you may have to repeat for 2 or 3 days to get rid of them all. My husband and I live at the beach so we don’t get drain flies here (that I know of) but we do get fruit flies. 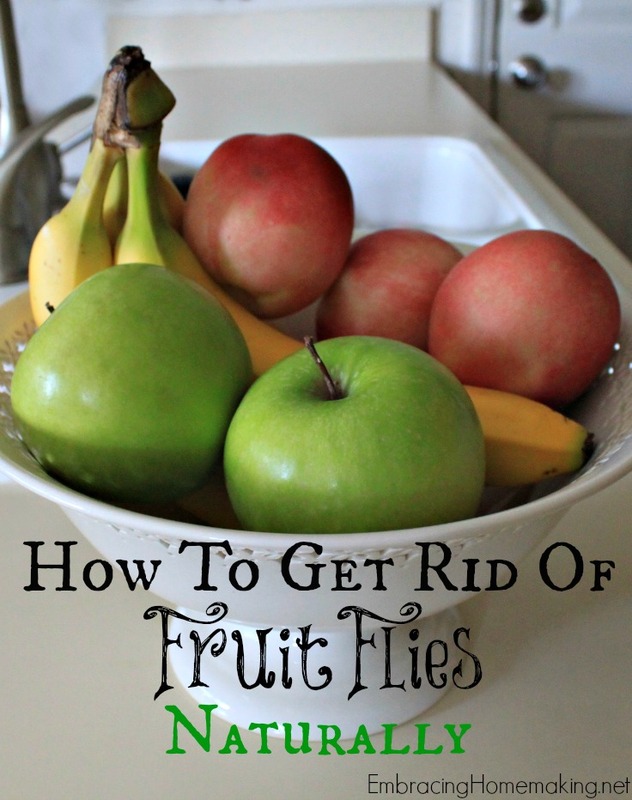 I buy a lot of fruit and although rare, when we do get fruit flies it grosses me out. I throw all the fruit away and wait for them to die off in a day or two. I never knew what to do, so thank you for all the great tips. I live at the beach and we get fruit flies from bananas! I just pour a little wine in a glass and leave it by the fruit bowl (and I ditch the fruit). I like to give those little buggars a happy farewell by getting them drunk before they drown! The pest control lady who came to my house every month to spray told me this: put a little baking soda (1/4 cup) in the drain, pour 1/2 cup vinegar in after; the combination causes a boiling action and kills the coating in the drain where the flies lay their eggs. The flies only live a day or two, so if there are no eggs, voila! Another trick I learned when I was searching the net for a science project for my grandson: Truvia sweetener kills fruit flies. This was discovered by a sixth grader’s research. I put it out in the lid of a jar and it keeps all flies out of my kitchen. I even put it outside if we are eating outdoors and it keeps insects away. We always just vacuumed them up!